Four healthy adult men, 20 to 34 years old, served as participants in this study. 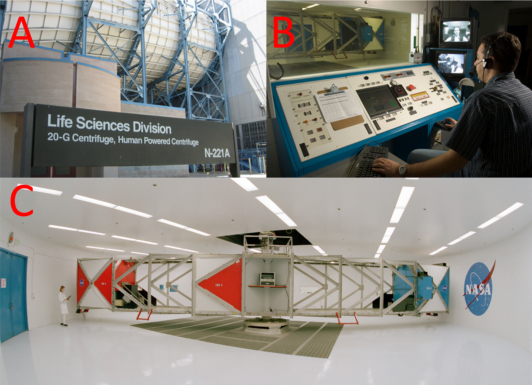 Participants were tested during prolonged (22 hour) exposures in the centrifuge at constant gravitational loads of 1.0 (base-line), 1.25 and 1.5g. 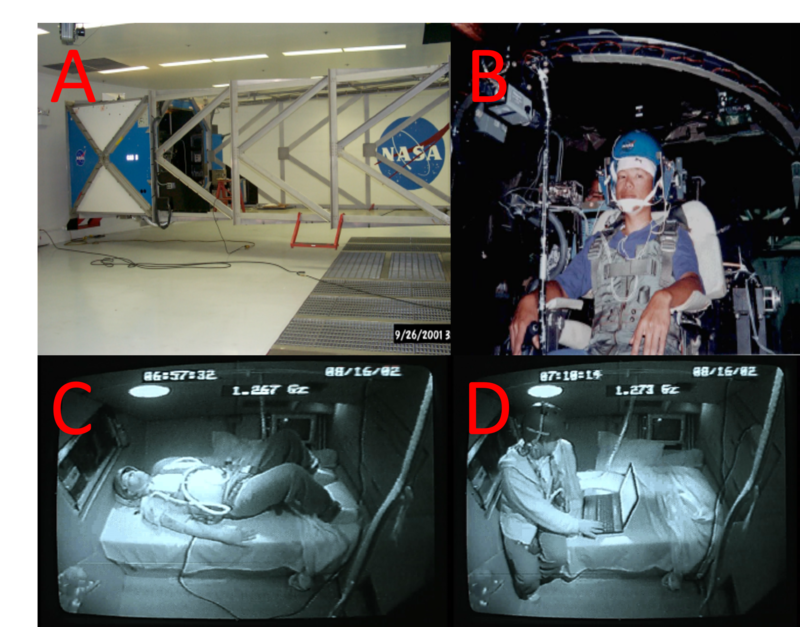 These tests were conducted at 7-day intervals in Cab B of the centrifuge, which contained a bed, collapsible toilet, storage area for food and water, a television and a laptop computer. Orthostatic tolerance during prolonged exposures was evaluated using a ‘stand test’ protocol: 3 minutes supine, 3 minutes sitting, and 3 minutes standing. Stand tests, a cognitive performance test battery, and self-reports of mood and symptoms were measured at 2- to 4-hour intervals, during prolonged exposures. +Gz tolerance tests (0.067 g/second) were conducted in Cab A, before and after each 22-hour prolonged exposure. Physiological data were collected continuously during the prolonged exposures and g-tolerance. Urine samples were collected at regular intervals and were used to perform targeted metabolomics. To provide an enhanced understanding of changes in orthostatic tolerance during prolonged exposures. A future objective would be to determine if humans could perform emergency and other technical procedures, while under constant gravitational loads above 1g. See Summary of Hypergravity Effects Below. Prolonged hyper‐gravity exposures can induce motion sickness, physical inactivity, fatigue, and susceptibility to orthostatic intolerance. One subject experienced severe motion sickness at 1.5 g after 14 hours exposure, but was able to maintain orthostasis. Physiological response magnitudes to orthostatic stress progressively increased from 1.0G to 1.5G. This subject (at 1.5 g) demonstrated a significant rise followed by a precipitous fall in 8-epi-PGF2α (F2 isoprostane), which was associated with vomiting. 8-epi-PGF2α is a smooth muscle agonist (an enantiomer of the known smooth muscle agonist PGF2α) and is produced under conditions of oxidative stress. 8-epi-PGF2α formation may contribute to GI motility and symptoms of motion intolerance. One subject experienced syncope at 1.25 g after 14 hours exposure. Physiological response magnitudes to orthostatic stress showed only slight increases from 1.0G to 1.25G. Performance proficiency and mood were maintained, during prolonged exposures except for the affective mood states which showed a progressive deterioration at 1.25G. One subject showed progressive deterioration in mood and performance from 1.0G to 1.5G. Most mood and performance metrics showed the expected circadian rhythm modulation with minima at midnight.